BeenThere-DoneThat: Brecon, Brecknockshire (Powys), Wales. 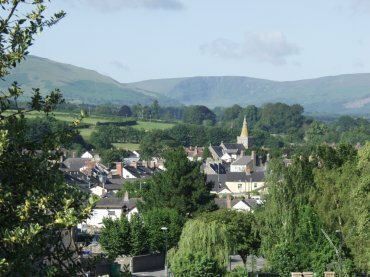 A view across the town looking towards the Brecon Beacons - the hills in the distance. Brecon is, of course, the county town of Brecknockshire and the town is sometmes called Brecknock. We were able to spend only three days in Brecon but covered a lot of ground in that time and decided that we like Brecon and the Brecon Beacons area very much. A view across the town in the early morning sun from the window of our room in The Castle of Brecon Hotel where we stayed in July 2006. 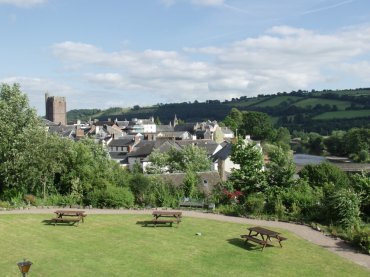 The tower of St. Mary's Church is easily visible and the River Usk can be seen on the right with just the top of the 16th century Usk Bridge showing. This was a delightful town with a good range of shops and lots of interest. 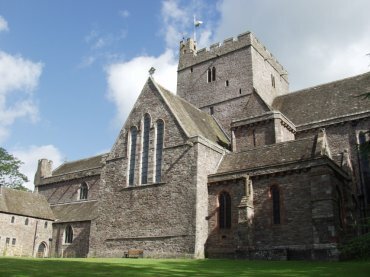 The cathedral church of St. John the Evangelist was originally part of a priory founded in 1098, rebuilt and extended in the Gothic style in about 1215 but did not receive cathedral status until 1923. It is situated, appropriately enough, on Priory Hill and the Cathedral Close is small but rather nice and there is a wooded dell, The Groves, next to the close on one side through which runs the River Honddu. 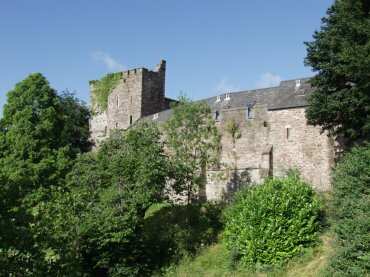 The castle is Norman in origin and sits on a mound overlooking both the River Honddu and the River Usk. This view is from near Castle Bridge over the River Honddu and it may look quite impressive but unfortunately there isn't much of it left. The River Usk is just one of three rivers that run through Brecon. 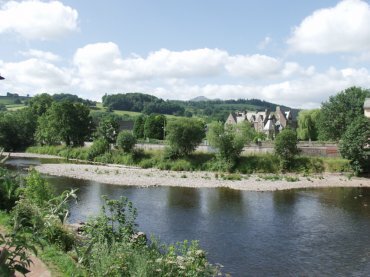 The other two, the River Tarell and the River Honddu run into the River Usk within the town. The Brecon and Monmouth Canal also terminates in the town. On the horizon you can just see the top of one of the Brecon Beacons.